What Comprises Your Company Culture? Want a solid definition of what employees are talking about when they discuss your workplace culture? Culture is the work environment that you supply for employees. Employees are motivated and most satisfied when their needs and values are consistent with those manifested in your workplace culture. From the initial application until an employee is hired, both the employer and the prospective employee attempt to determine if the applicant is a good cultural fit. Culture is difficult to define, but you generally know when you have found an employee who appears to fit your culture. Culture is the environment in which you work all of the time. Culture is a powerful element that shapes your work enjoyment, your work relationships, and your work processes. But, culture is something that you cannot actually see, except through its physical manifestations in your workplace. While a particular culture exists in your organization that has been developed by the employees who work in your company, each new employee adds their diversity to your work culture. So, while a culture exists when a new employee joins, he or she is soon adding to the culture experienced by employees at work. Culture is like personality. In a person, the personality is made up of the values, beliefs, underlying assumptions, interests, experiences, upbringing, and habits that create a person's behavior. Culture is made up of the values, beliefs, underlying assumptions, attitudes, and behaviors shared by a group of people. Culture is the behavior that results when a group arrives at a set of—generally unspoken and unwritten—rules for how they will work together. Your culture is made up of all of the life experiences that each employee brings to the workplace. Culture is particularly influenced by the organization's founder, executives, and other managerial staff because of their role in decision making and strategic direction. Middle managers are also significant in the formation of your organizational culture as they are the glue that holds all of the rest of your employees in a manner that allows them to receive information and direction. The visual and verbal components of an organization's culture are noticeable every day at work. Whether you are walking through a work area, sitting in an office, attending a meeting, or eating in the lunchroom, the organization's culture surrounds you and permeates your working life. Something as simple as the objects chosen to grace an employee's desk tells you a lot about how employees view and participate in your organization’s culture. Your bulletin board content, the company newsletter, the interaction of employees in meetings, and the way in which people collaborate, speak volumes about your organizational culture. You can take a culture walk to see, appreciate, and observe your organization's current culture. You can also change your organization's culture. If the culture that has developed is unsupportive of reaching your business goals or of the environment you want to provide employees, culture change is a tough, but achievable, option. You can consciously shape the culture that you need for your organization's most significant opportunity for success. With consistent leadership that walks the talk, you can take on this challenge—and win. Enculturation is a socialization process by which new workers adjust to, and become part of, the corporate culture of their new company, office, department, workgroup, and so forth. 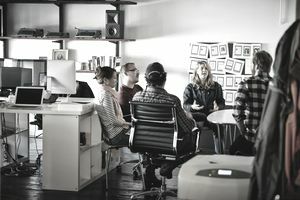 Some companies help new employees embrace their organization's culture through orientation or onboarding sessions and other Human Resources (HR) initiatives. assigning a well-informed, thoughtful mentor or buddy who can teach the new employee the company's culture and introduce the new employee to additional longer-term employees. Your goal with enculturation activities is to ensure the employee's cultural fit and to engage and onboard the new employee into your desired organizational culture.